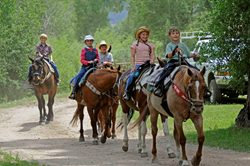 Families enjoy Western-style all-inclusive vacations at discounted rates in the “Dude Ranch Capital of the United States"
Grand County, Colo., announced special rates for families and couples at each of its four world-class dude ranches this summer. Located just 90 minutes west of Denver, these all-inclusive vacation spots are ideal for week-long getaways where fun is served up for the whole family, alongside Old West hospitality and the rustic beauty of the Colorado Rockies. Visit each ranch's website for a full list of activities and more information on booking. Bar Lazy J Ranch – The oldest continuously operating guest ranch in Colorado, Bar Lazy J offers visitors a truly Western experience in their friendly and laid-back atmosphere. Packages include lodging in private log cabins, chef-prepared meals, kids programs and a multitude of indoor and outdoor activities. Guests won’t want to miss the added 1500-foot zip line or casting into the Gold Medal trout fishing waters located on the property. Seasonal Discount: A 10 percent discount is offered the weeks of May 29th, June 5, June 12, Aug. 21, Aug. 28 and during the entire month of September. C Lazy U Ranch – Known for its rich history, rustic elegance and “5-Spur Service,” this ranch was recently named the no. 1 resort in Colorado, fourth best resort in the United States and the 13th best resort in the world by the Condé Nast Readers’ Choice Awards. Luxurious cabins, gourmet meals and a deluxe spa make C Lazy U the epitome of Western luxury. Families can also have fun roughing it outdoors for a fully-equipped night of luxury camping. Seasonal Discount: Book the Sunset cabin for June 12-19 or June 19-26 with a family of four or more by March 31 and get a 10 percent discount. Drowsy Water Ranch – Recently named top ten in all-inclusive resorts by TripAdvisor and Parents Magazine, Drowsy Water is a world-class crowd-pleaser catering to guests of all ages. Its recognized children’s program keeps infants to teenagers entertained with classic ranch recreation while parents and couples relax or take part in some fun as well. Friendships and memories are made to last a lifetime at this family-oriented vacation ranch. Seasonal Discount: Families get 5percent off the week of June 5 and 10 percent off the week of Aug. 21. Aug. 28 and Sept.4 are adults-only weeks and carry a 15 percent discount. Latigo Ranch – Another award-winning dude ranch, the Latigo Ranch presents a more intimate ranch encounter with modern log cabins accommodating no more than 35 guests on the property. It's easy to make friends, as well as memories, at Latigo's cookouts and country dances or learning roping and cow-penning. At Latigo, families find the right balance of a dude ranch experience with all the comforts of a vacation. Seasonal Discount: Stay the week of June 5 for over 10% off the regular summer rate. For more information about dude ranches and other destinations, activities and special events in Grand County, visit http://www.visitgrandcounty.com and http://www.facebook.com/grandcountycolorado. Follow @grandcountyco on Twitter and http://www.pinterest.com/grandcountyco on Pinterest. Located 67 miles west of Denver, Grand County is home to wide-open spaces, breathtaking mountain scenery and authentic old-west towns. Outdoor recreational activities include golf, boating, fishing, biking, hiking, fishing, hunting, horseback riding, skiing, cross country skiing, snowmobiling, ice fishing, sleigh rides and tubing. The area features more than 600 miles of mapped and marked trails, one national park, two national forests, two wilderness areas, two national scenic byways, two major ski resorts, five world-class dude ranches and four mountain golf courses. Grand County’s extensive water network includes Colorado’s largest natural lake, 1,000 miles of streams, 1,000 acres of high-mountain lakes and 11,000 acres of reservoirs.